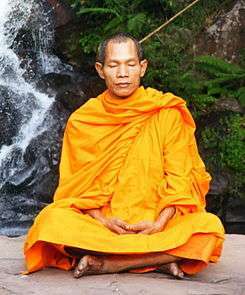 Buddhism (Pali/Sanskrit: बौद्ध धर्म Buddha Dharma) is a religion and philosophy encompassing a variety of traditions, beliefs and practices, largely based on teachings attributed to Siddhartha Gautama, commonly known as the Buddha, "the awakened one". 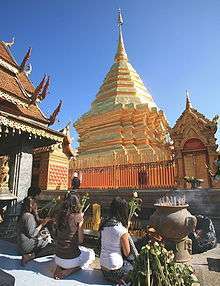 Theravada — literally, "the Teaching of the Elders" or "the Ancient Teaching", it is the oldest surviving Buddhist school. It was founded in India. 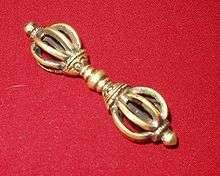 It is relatively conservative, and generally closer to early Buddhism, and for many centuries has been the predominant religion of Sri Lanka (now about 70% of the population) and most of continental Southeast Asia. 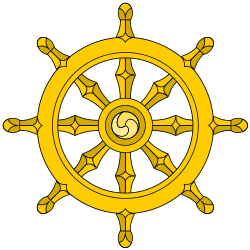 Mahayana — literally the "Great Vehicle", it is the largest school of Buddhism, and originated in India. 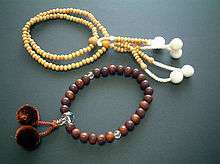 The term is also used for classification of Buddhist philosophies and practice. According to the teachings of Mahāyāna traditions, "Mahāyāna" also refers to the path of seeking complete enlightenment for the benefit of all sentient beings, also called "Bodhisattvayāna", or the "Bodhisattva Vehicle." Percentage of formal/practicing Buddhists by the numbers of registered adherents (according to the least estimates). Percentage of cultural/nominal adherents of combined Buddhism with its related religions (according to the highest estimates). 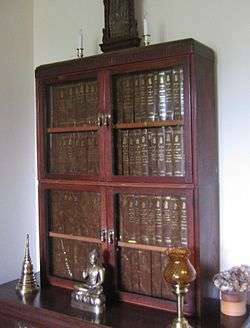 A collection of the Pali canon. The Tripitaka Koreana in storage at Haeinsa. When this isn't, that isn't. From the cessation of this comes the cessation of that. Imasmiṃ sati, idaṃ hoti. Imasmiṃ asati, idaṃ na hoti. 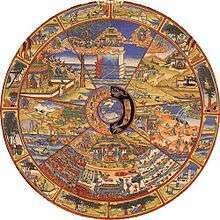 The bhavachakra, a symbolic depiction of the six realms. Nissaggiya pacittiya — thirty rules entailing "confession with forfeiture"
Kāyagatāsati — Mindfulness of the body — reflecting earnestly and repeatedly on the impurity of the body which is composed of the detestable 32 constituents such as hair, body hair, nails, teeth, skin, etc. Kensho — "Seeing one's nature"
Buddhist monks on daily alms round. 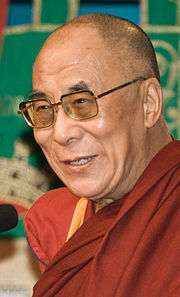 Rinpoche — an honorific which literally means "precious one"
His Holiness the 14th Dalai Lama, Tenzin Gyatso, a renowned Tibetan lama. Golden statue of Nagarjuna at Samye Ling Monastery. Is the self identical with the body? or is it different from the body? Does the Tathagata exist after death? Mahabodhi Temple in India, a common site of pilgrimage. From a 12th-century Greek manuscript: Saint Josaphat preaches the Gospel. This Dhamma is for one who wants little, not for one who wants much. This Dhamma is for the contented, not for the discontented. This Dhamma is for the secluded, not for one fond of society. This Dhamma is for the energetic, not for the lazy. This Dhamma is for the mindful, not for the unmindful. This Dhamma is for the composed, not for the uncomposed. This Dhamma is for the wise, not for the unwise. ↑ Williams (2000, pp. 6-7) writes: "As a matter of fact Buddhism in mainland India itself had all but ceased to exist by the thirteenth century CE, although by that time it had spread to Tibet, China, Japan, and Southeast Asia." (Originally 1958), "Chronology," p. xxix: "c. 1000-1200: Buddhism disappears as [an] organized religious force in India." See also, Robinson & Johnson (1970/1982), pp. 100-1, 108 Fig. 1; and, Harvey (1990/2007), pp. 139-40. ↑ Gethin, Rupert. The Foundations of Buddhism, p1. Oxford University Press, 1998. ↑ "The World Factbook: Sri Lanka". CIA World Factbook. Retrieved 2006-08-12. .